Jan Stephenson has taken a hands-on approach to reviving her Tarpon Woods course. PALM HARBOR, Florida – Jan Stephenson is about to go into the World Golf Hall of Fame. That’s not surprising given that she won 16 LPGA tournaments including three majors, among them the 1982 LPGA Championship and 1983 U.S. Women’s Open. She also has 41 world-wide wins including 10 titles on the LPGA’s Legends circuit. That’s a lot of wins – but there’s more. She’s also involved in tons of outside projects, more – in fact – than virtually every other touring pro, man or woman. And, one of those projects is particularly special. On April 1, 2017, Stephenson – through her Crossroads Foundation – bought a golf course. It’s not all that surprising for a touring golf professional of Stephenson’s stature to own – or at least partly own – a course somewhere. Again, though, Stephenson’s course is particularly special. She bought it to help others. That’s why it is officially owned by Stephenson’s foundation. 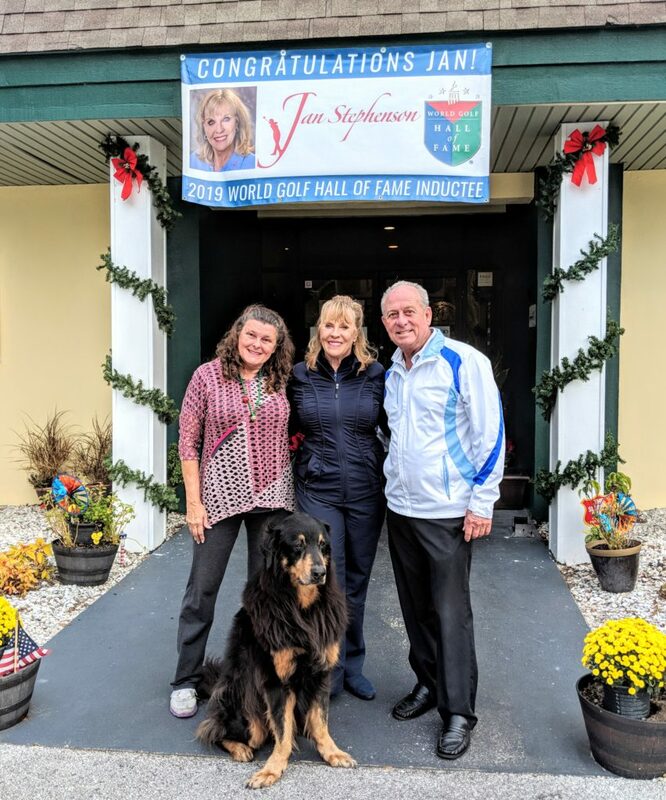 Diane and Michael Vandiver and service dog Eddie are all part of Jan Stephenson’s Crossroads Foundation team in her newest golf venture, the Tarpon Woods Golf Club. Many of Stephenson’s golf memorabilia items have been used to decorate the clubhouse but there’s much more to her involvement than that. 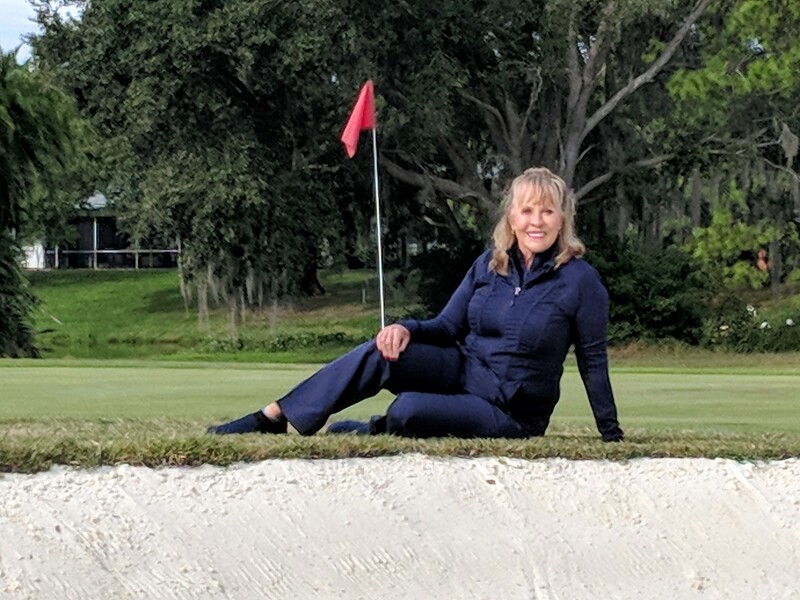 Though her purchase of Tarpon Woods Golf Club was no secret, Stephenson has doubts that even her fellow members of the LPGA Legends Tour realize just what the purchase meant. Improvements to the outdoor garden dining area are part of the Tarpon Woods’ upgrades. Tarpon Woods was built as a high-end private club in 1971 with Lane Marshall the course designer. In the 1990s it was called the Lost Oaks of Innisbrook and owned by the flourishing upscale Innisbrook Resort about eight miles away. Over the years it was particularly popular when the New York Yankees held their spring training nearby. The Yankees’ owner, George Steinbrenner, particularly liked to play the course. It remains a par-72 that measures 6,613 yards from the back tees but lots of things changed, and not for the better, as Tarpon Woods was converted to a public venue under different owners. The club was certainly no hot spot when Stephenson’s foundation took it over. Then things got worse. Hurricane Irma hit, and that slowed down the restoration efforts. Those were being done by with a hands-on approach that even included Stephenson coming over to trim hedges and pull weeds. Her brother Greg, who is a first responder, spent a few months painting the clubhouse. 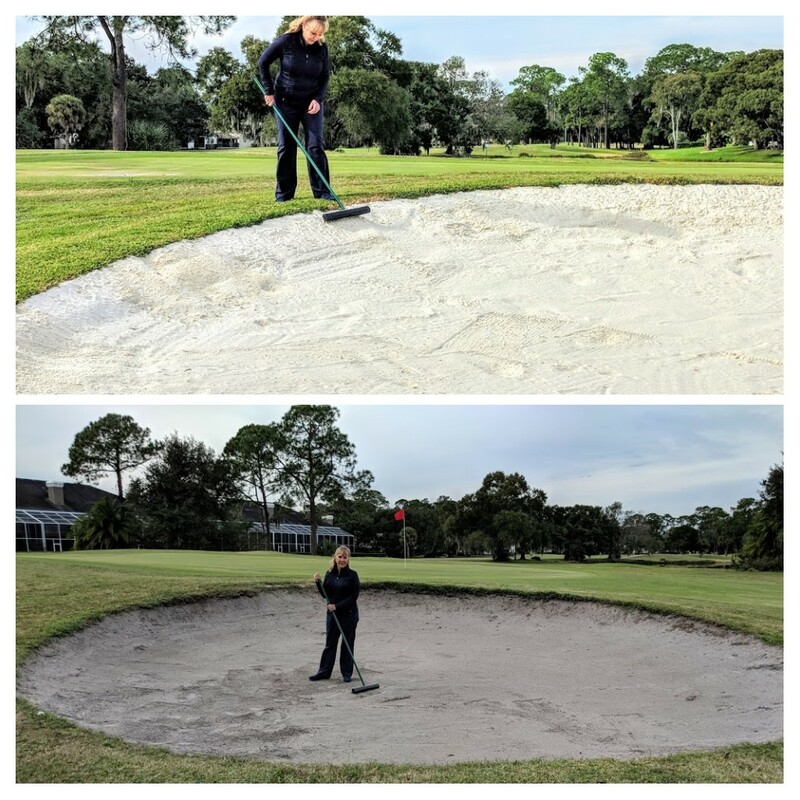 It’s out with the old and in with the new on Tarpon Woods’ ongoing bunker renovation. Vandiver, who is also president of club manufacturer Razor Golf, and his wife Diane are also deeply involved in the day-to-day operations. Stephenson is also part owner of Razor Golf and Vandiver also works with Jan Stephenson Events – a side business that puts on concerts and other entertainment events. Tarpon Woods is another of their joint ventures, and it’s been a rewarding one as public play is picking up and thousands of veterans have already benefitted from visiting there. 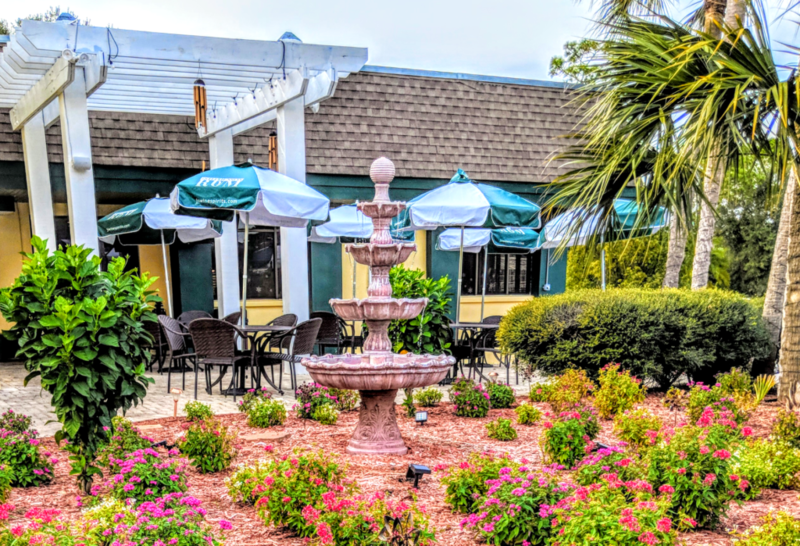 The club has all brand new golf carts, and veterans and first responders get 20 percent off on greens fees as well as discounts in the restaurant and well-stocked pro shop. Stephenson has organized monthly clinics for the disabled and about 50 – ranging in age from 14 to 80 – turned out for a clinic designed for blind golfers. She has also hosted a fund-raiser – the Jan Stephenson Invitational Pro-Am – that included Robert Gamez and Cindy Figg-Currier, a couple of former tour players. Vandiver is tackling a bunker renovation in an innovative way. He’s trying to raise $90,000 via corporate and individual donations. He says one bunker can be renovated at a cost of $2,360 but he’d like to find 18 corporations willing to donate $5,000 for the project. The bunker renovation isn’t just for a cosmetic improvement. The bunkers need to be re-designed to accommodate the disabled golfers. The Australia-born Stephenson, who has lived in nearby New Port Richey the last seven years and obtained her U.S. citizenship the same month she acquired the course, has another goal for Tarpon Woods. She wants a building to be built specifically for teaching golf to the veterans.